alaTest on kerännyt ja analysoinut 89 arvostelut tuotteelle Sony GTK-N1BT. Keskimääräinen antama arvosana tälle tuotteelle on 4.7/5, verrattuna keskimääräiseen arvosanaan 4.1/5 kategoriassa Audiolaitteet. Me analysoimme käyttäjien ja ammattilaisten antamia arvosteluita, tuotteen ikää ja muita seikkoja. Verraten muihin tuotteisiin kategoriassa Audiolaitteet, Sony GTK-N1BT on saanut alaScore™-arvosanan 89/100 = Erittäin hyvä.
" Great sound and easy to set up. Looks good too with the changing coloured lights. " Great sound quality and looks!
" I'm very pleased with my purchase, the sound is of high quality and the bass is fantastic I would recommend this product to a friend "
" The product has good value for the money you pay, and I strong advise. " " Very good for today's life. Portable,all in one. " " Brought this for over the festive period, easy to set up and pairs by bluetooth with upto 10 devices which was great for the family. 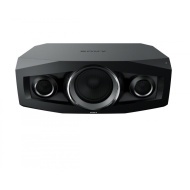 Looks impressive and sound quality is great, well worth the price! " " Good value for money as purchased in sale. A lot bigger than expected but the sound quality is good. A gift for my son who really liked the LEDs and the ease of use. Plug in, link to I-Phone and away you go. " " Great system although a little tricky on set up! "